With the warm weather, now is the perfect time to get outside, especially when you are having family and friends over. The summer weather may cause people to use more electricity, especially when trying to cool your home. We put together a few tips that may help you lower your electric usage, while you have a blast outside. Switch to LED bulbs for outside lighting. Do you have a well-lit backyard? Upgrade to LED bulbs to keep it well-lit while using less energy than incandescent bulbs. This alone could help you save hundreds of dollars over the summer. No more zapper. Bugs during the summertime are such a buzzkill! Although you might want to use the electric bug zapper, go for a citronella candle instead to keep the bugs out. Fire up the grill. This is the perfect time to enjoy food cooked on the grill. Cooking your dinner for the evening on the grill is an energy-efficient way to prepare food. Shut down the AC while you’re outside. Stop wasting energy cooling your house when you are spending time outside. Instead turn the AC back on about 30 minutes before you plan on coming back in. Allow the shade. Utilize the natural shade from the trees in your yard to keep cool from the summer sun. Get everyone together and enjoy the summer in your backyard, while using less electricity inside the house. This entry was posted in Community, Energy Efficiency and tagged Champion Energy, champion energy employees, community, electricity, Electricity Costs, energy efficiency, energy saving, energy savings, energy tips, energytips, how to, hurricane season on August 21, 2017 by Ashley Leach. 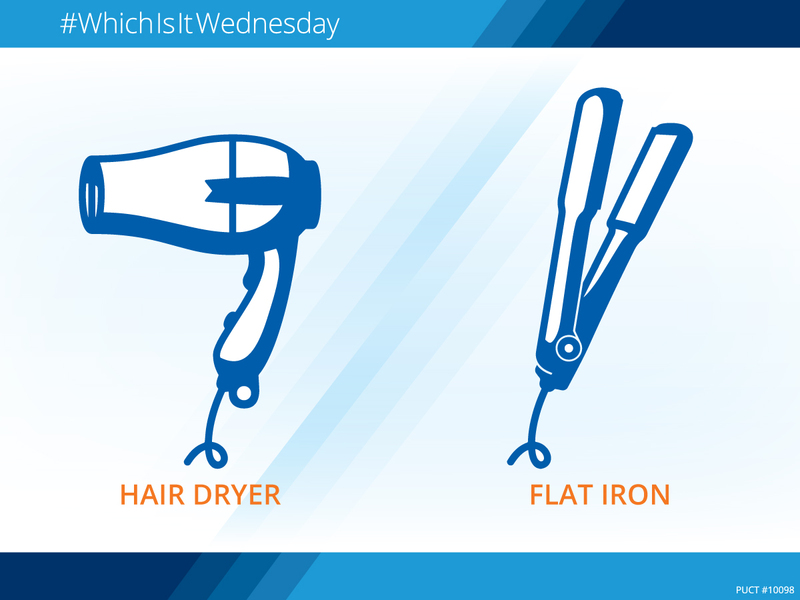 Which is it Wednesday: Flat Iron or Blow Dryer? Did you know that hair care is a multi-billion dollar industry? Whether it’s coloring or styling our hair, we always try to look our best. From spending time curling our hair to ironing out frizzy hair, women want to look and feel good. Have you ever considered just how much energy your flat iron or blow dryer use while you get ready for the day? We reviewed the typical energy use of each appliance that might help you decide how to style your hair going forward. Wow that is a BIG difference in wattage! Considering that warmer weather has arrived, skip blow drying your hair and let your hair air dry as you finish getting ready for your day. Once your hair is dry, go ahead and use your flat iron to style it exactly how you like it. This entry was posted in Electric Choice, Energy Efficiency, Savings and tagged Champion Energy, champion energy employees, electric rates, electricity, Electricity Costs, money saving on July 5, 2017 by Ashley Leach.